The 1.0 Liter Red is back for a limited time. A perfect accent piece on any modern bar or kitchen countertop. 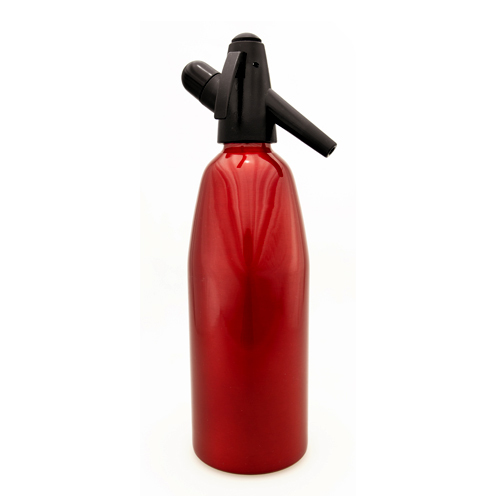 Aluminum Red 1.0 Liter body with Beautiful Red Painted Finish with Black ABS Head with Cartridge Holder. 1 box of 10 8g CO2 cartridges. How to use: Fill bottle with tap or bottled water and transfer gas into the bottle. Chill and the CO2 becomes saturated in the water creating the fizz. Push the lever on the side and dispense into a glass. Keep refrigerated for best fizz quality. Main Advantages: Makes and keeps fizzy soda water fresh for months. No loss of carbonation. You control the water quality and decide what to add. Do not have to carry home heavy bottles of soda. 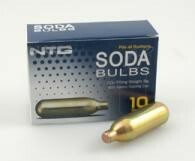 Known Compatibility: This bottle works with iSi 8g CO2 chargers, NTG Soda Bulbs, Leland Seltzer Chargers, Liss 8gr CO2, Kayser Soda Chargers, United Brands CO2 and Best Whip 8g CO2 cartridges. Twist n Sparkle 8g CO2 cylinders are fine also. Soda Club CO2 and Penguin Soda Gas do not work with this bottle. Warranty: One year warranty to the original purchaser with proof of purchase. Full details are available at www.mrfizz.com.